In the small country of Transylvania there is a legend which says that every 100 years the forces of Good mysteriously become weak and the forces of Evil gain a foothold into our world. The evil manifests itself in the form of one of the most feared characters to roam the earth -- the vampire Dracula! Every 100 years Dracula is revived and grows stronger and stronger. His goal is to turn all humanity into creatures of darkness, to be ruled under his iron first. He has appeared in this world many times, and there are many people who fear that in his next appearance, he may be unstoppable. There is one group that has always been around to see that Dracula is defeated, the Belmont family. For generations the Belmonts have passed along the secrets and skills of vampire-hunting to the eldest child of the family. While many of the Belmonts have lived peaceful lives without encountering Dracula, they remain prepared. There are occasional skirmishes with lesser monsters, but the Belmont clan has always emerged victorious. Now, 100 years have passed since the last battle between Dracula and the Belmonts. Transylvanians are reporting mysterious sightings of odd creatures appearing under the cover of darkness. As Spring approaches, the citizens prepare for a traditional celebration. Unbeknownst to them, an evil group of people is holding a ceremony in the old destroyed abbey outside of the town, attempting to revive the Prince of Darkness. As they carry out their ritual a dark cloud descends over the countryside. The sinister group stirs itself into a frenzy of mysterious chanting and pagan dancing, then lightning strikes the abbey. The ground bucks under their feet, and the abbey walls shudder. Once again, Dracula is revived! --From the SNES Castlevania 4: Super Castlevania instruction manual. Play Castlevania 4: Super Castlevania Now! Castlevania has always been one of Konami's biggest series. Castlevania 4 was an excellent addition, one of the best, in my humble opinion. The graphics were well rendered and brightly colored. The sounds were upgraded with just enough of the original score to remind you of the good old days. The controls were a lot better, with the ability to throw your whip in any direction and the secondary weapon getting its own button. 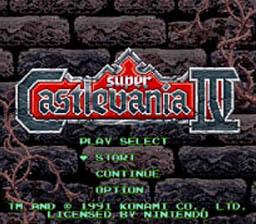 The gameplay stuck to the original side-scrolling asdventure formula, which was a treat to Castlevania fans everywhere. Be sure to give this monumental addition to the series a try. Castlevania 4 laid down a lot of firsts for the Castlevania series. For instance, this was the first Castlevania to feature the ability to throw your whip in any direction. It was also the first to feature the ability to use your whip as a swing like Indiana Jones. Since the SNES had a controller with more buttons, it also debuted a separate button for the secondary weapon, which eliminated the "random axe being thrown while walking up the stairs" aggravation. Castlevania 4 was also the first to feature the ability to change the direction Belmont is looking in mid-air. Speaking of jumping, this was also the first game in the series to allow you to jump on to a staircase. Throw in the ability to crouch walk, the ability to hold your whip out in front of you like a shield, and a "true to the Castlevania series" theme, and you've got yourself a great game! These tasty additions were the only real difference in gameplay from the first and third games. Power-up items are found in candles and include: whip upgrade- turns your whip from leather to chain the first time, and makes it longer the second; small heart- one heart; large heart- five hearts; leg roast- refills half of your life; whole roast- refills all your life; double shot- allows you to throw two secondary weapons; triple shot- allows you to throw three secondary weapons; rosary- destroys all enemies on a screen; potion- makes you temporarily invincible; bag of gold- extra points. You will also find the secondary weapons in candles. The dagger flies straight and only costs one heart to use, but it is weak. The axe is powerful and only costs one heart, but it flies in an arc so it's hard to hit with sometimes. The holy water costs only one heart and is thrown on the floor: it creates a little fire when it breaks that enemies will walk into for multiple hits. Its only downfall is short distance. The boomerang will fly straight and return to you for another pass at enemies. It does good damage and only costs one heart. The stopwatch will stop all enemies for a few seconds, but it costs five hearts to use. Just like parts one and three, you will have a boss at the end of each level. You will get an orb for beating him, your life will be refilled, points will be tallied, and you will move on to the next level. In the last stage, before you climb the stairs to Dracula, jump down to the left. You will land on an invisible platform. Move all the way to the left of the screen and you will get full health, 99 hearts, a cross, a full upgraded whip, and a triple shot.